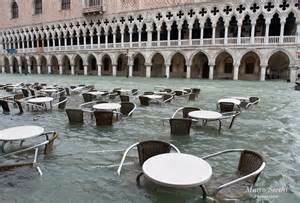 Last year on the morning of November 11th, we were awoken to the high-pitched siren that warns the residents of Venice that acqua alta (high water) would be arriving within the next 3 hours. We were very used to this, but normally the siren only signals moderate high tide, but that morning was different. This time the signals let us know that the high tide would be at the max – which is 140cm+ of high tide – which is very high! (I will go into detail about acqua alta and explain it all in a later post). “Oh no! This cannot be happening! Today is Kaitlin’s cresima (confirmation) and we are having 30 people over for lunch after the mass!” I shouted. But it was happening. My sister-in-law, Cathy, had just arrived from LA the night before to celebrate with Kaitlin, her god-daughter, and was in for quite an interesting day in Venice! Not only was there high tide, but it was also raining, which added more complications to the day. My house had been clean and ready the night before to welcome our visitors for lunch immediately after the mass and I did not have a lot of extra time for any wrinkles in the plan. But there went Todd, going downstairs to our storage room which was safe at 120cm of high tide, but would be flooded if it got any higher. He spent 30 minutes carrying dusty boxes upstairs and into our clean house where we had to store them in our study for the day. As we were leaving to walk to the church, the tide had hit it’s max and Todd had to carry Trevor because in some areas on the streets the water was up to Trevor’s mid-thigh and going over his rain boots. I had to walk so slow as to not let the water splash inside my boots and Cathy’s boots didn’t work at all, leaving her feet soaked and frozen. When we arrived at church, all of the kids making their confirmation and their parents were in a commotion trying to change quickly from rain boots into their nice shoes and fix hair and make-up for photos to be taken by the waiting photographer. All seemed to work out fine until we were told that the bishop from Rome was stuck in his hotel and the mass would have to be postponed for at least an hour. 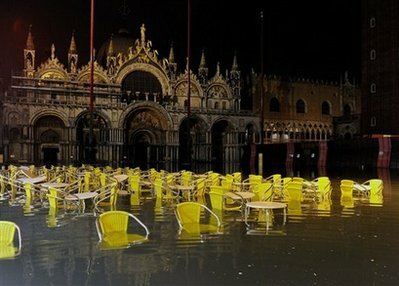 Only in Venice! The bishop could not get a water taxi due to the high tide and the low bridges and he was too far to walk with so much water – he just had to wait for the water to subside! Here are two photos of us that day. Since we are traveling and many of last year’s photos are in back-up drives that are not with me, I cannot show you the pics of our campo and streets filled with water or us wading through knee-high water on the way to church. But as soon as I can get to them, I will post them! Now that we have left Venice, I look back on Kaitlin’s confirmation day with such fond memories because it was such a unique experience that could only happen in Venice!